10) Don't blog about ANYTHING ELSE AT ALL until the creation of a new 'about' page to explain my blog's policies on all sorts of issues including transparency, product reviews, reciprocal linking, advertising et al is complete, so that in 2007 I will no longer need to spend an hour a day custom-explaining these things to strangers via email. Let's set a date. I'm totally yours! Well I'm up for the new weekly recipe you cook with Amanda Berne-- yeah I'm happy to b one of the friends you invite round for having supper. I hear you on that last one though--! I'm with ya on 3,4! Happy New Year, Sam! Good luck and I can't wait to see this 'rules of BnP' content! I think a lot of us need to do that. Can't wait to see what you do with Caviar, Truffles & Foie Gras! Great list, Sam. Challenging but doable. I see some of my resolutions on there, too. I have an embarrassing number of never-been-used cookbooks. And I keep hearing wonderful things about about Hugh F-W and The River Cottage. Must investigate further. Here's to a Happy & Delicious New Year! P.S. Congratulations on your Food Blog Award nominations! I voted for you in both of the Food Blog Awards for which you are nominated, and am asking my readers to do the same. I am also asking them not to waste a vote on me (Well Fed didn't even tell me I was nominated), so don't think I'm pimping here. Happy New Year and good luck with your list. What is this "real world" of which you speak? It's a very commendable, and hopefully doable, list. I just bought a sausage grinder and stuffer to accompany my Ruhlman book. A toast to all of us in 2007! I can never think of New Year's resolutions, but I like the idea of keeping them in the context of food. Among mine would be learning to master making aioli and poached eggs and having people over to eat more often. Must share. Darlin', you are a comitted woman and thurough one. I have faith that you'll shine on all of these. Plus, a sausage maker, I mean, that right there screams adventure, good food, and probably a really funny story in the end. Great list Sam. I think I'll take a few of your resolutions on board. Nice little selection of books. The HFW one is great, and rarely leaves my kitchen. Look out for his "Fish" book coming later this year! 4. Great! Invite me and we can jointly do an English thing. 6. can I come too? 7. like cookie said, what "real" world? 10. are you crazy? even my mum wouldn't spend her time "explaining" these issues and she's really very English. You've got a very big heart! Cheers to you! Just got a sausage stuffer. I'm gonna try to use it as often as possible but fear that like so many other things it will end up in the drawer after 2 or 3 uses. Hahaha! #10's been on my list forever. Except that I keep blogging anyway...damn! #8 - is what I want to get Dave for his birthday. Oh, how he covets the sausage stuffer. Ahem. For the KitchenAid, I mean. May I please borrow your Marmite Cookbook? I love your blog (insert name here), it is so (insert adjective here). I read it all the darned time! I was hoping you might want a copy of my new book, a link to my site, a few free pounds of papaya-sun-dried-tomato flavored puppy kibble and an invitation to check out our new rotating tire-wrench factory. I promise, you'll love it! Please add me to your spam list, ignore my pleas and remember, I know nothing about you or your site! Hey everybody vote for Sam as best food blogger! The Well Fed Network has announced the nominees for the 2006 Food Blog Awards. Becks & Posh is up for two awards (City and Restaurant Review). sound like some good resolutions! I like the one about making sure to used unused cookbooks, I think I have a couple of those floating around too! 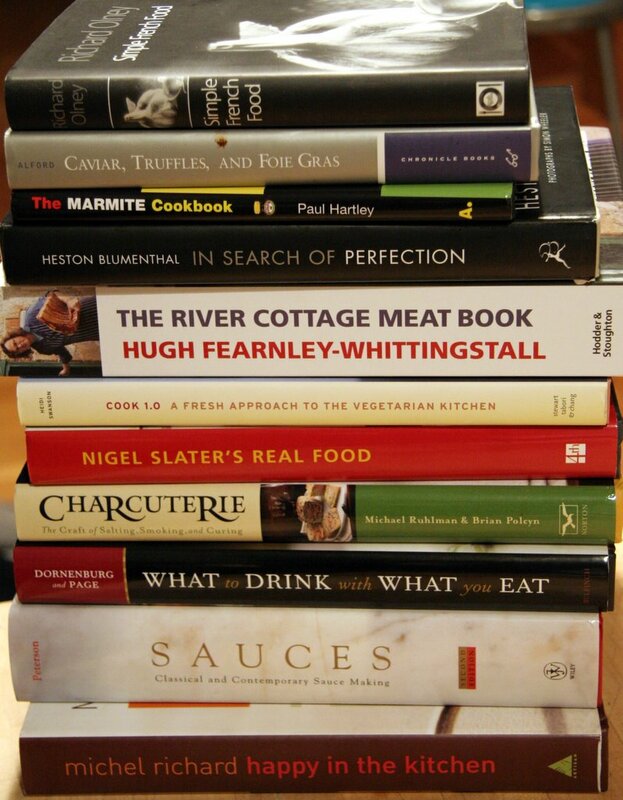 When I came across the sausage goal, I thought 'if only she had Ruhlman's Charcuterie book'. Then I saw your picture. Try his master recipe for pork sausage, and pay attention to cooking temp, as he suggests. You won't regret it. A tip: don't ad-lib here. It's like baking, I've found - recipe matters. Also - if you don't make your own bacon yet, try it [see the book] and you won't go back. Look at me, telling you what to do. Bossy-me.